Are a True Key to Health! more people than ever getting cancer? PEOs are the two particular polyunsaturated (Omega) vegetable oils, known scientifically as 1. Linoleic Acid (LA) (Parent Omega 6) and 2. Alpha Linolenic Acid (ALA) (Parent Omega 3) They are are short-chain, “oxygen- attracting” oils. They are found in seeds and plants. They are important for a couple of reasons, but the one we are focusing on is that they readily intake, hold and release oxygen. It is important to understand that oils make up 50% of the bi-lipid membrane that surrounds each cell in the body. Ideally, up to a third of these oils will be PEOs, which help oxygen readily move from the bloodstream into the cell. These two oils cannot be made by the body and so must come from the diet, which is why Brian Peskin has coined the phrase, Parent Essential Oils (PEOs), for referring to them. Oxygen Inside the Cells is Paramount to Health Having optimum amounts of oxygen within human cells enables the creation of optimum amounts of energy in cellular mitochondria. Ample oxygen is essential to both cellular fires and campfires. Just as a campfire doesn’t burn well without oxygen, so, too, without enough oxygen, cellular mitochondria have a difficult time burning fuel (carbohydrates or fats) to make energy for the cell to be healthy. And, total health is the result of the cumulative health of one’s cells. Therefore, ensuring the adequacy of cellular oxygen is near the absolute top of any list of health priorities that one should have. However, deep breathing and oxygen supplements are not the way to do that. The way to do that is to ensure that one’s cell membranes are constructed from the two, thin, “oxygen-attracting” oils that we call Parent Essential Oils. ample levels of cellular oxygen. Because the thin, “oxygen-attracting” Parent Omega oils, Linoleic Acid (abbreviated as LA) and Alpha-Linolenic Acid (abbreviated as ALA) are unable to be manufactured by the body they must be be obtained through the diet. These oils are found in different amounts and ratios in many edible plants, seeds and grasses. You can see a list of the best food sources for these oils in our frequently asked questions. To start… you must understand the following: • Omega 3 and Omega 6 oils (or fatty acids) are critical to health. • There are two types of Omega 3 and Omega 6 fatty acids: o short-chain Omega 3 and 6 o long-chain Omega 3 and 6 • The body can make the long chain from the short-chain, but you have to eat the short-chain. If you don’t eat them, you will eventually die since they are essential for health. • One needs to eat short-chain Omega oils, but they need to be eaten in a raw and undamaged state. • Cooked or processed short-chain Omega oils are insidiously harmful to the body because they slowly undermine health by reducing cellular oxygen and by preventing the body from making long-term Omega oils. • Unfortunately, most people eat damaged Omega oils almost exclusively… since they are pervasive in our modern world of cooked and processed food. • People must learn to eat undamaged short-chain Omega oils if they want optimum and long lasting health. There exist two challenges with eating enough functional PEOs to meet the body’s requirements for them. Those challenges are: 1. Getting enough of both Parent Essential oils — since they function as a tag team, both of them are needed. Since PEO food sources are unbalanced in their amounts of these oils, it is paramount to eat a variety of PEO containing foods, in order to get enough of both of them. 2. Ensuring that the PEOs one eats have not been adulterated — through heat, light or chemical processing is also a challenge. These fragile oils are easily damaged. Altered or cooked PEOs do the opposite of enabling optimum cell oxygen. They actually hinder the transfer of oxygen into cells. So, eating damaged PEOs undermines health, especially when done long term. In our modern world, most of the food we eat is processed or cooked. 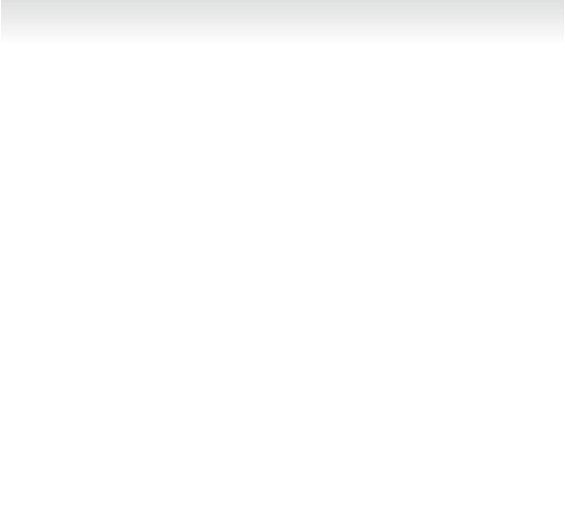 Unfortunately, processing and cooking ruin PEOs. If the foods that contain them or the PEOs, themselves, have been processed in a manner than damages them, especially, if they are subjected to the high heat of cooking, or if light reaches them (e.g. if the oils are in packaged in transparent bottles), then the PEOs will be damaged or adulterated. And, if damaged PEOs are consumed, the adulterated PEOs will still incorporate into cell membranes, but instead of improving oxygen transfer into cells, they will impede that transfer of oxygen. What that means is that consuming adulterated vegetable oils may undermine one’s health significantly — in just a few decades of consumption, affecting adversely the entire health of one’s body, from one’s brain and cardiovascular system down to one’s feet and toes… as they incorporate into cell membranes and reduce cellular oxygen content, one cell at a time. It is the scientifically-supported position of Brian Peskin and other nutritional scientists that the greatest contributing cause to our modern cancer and cardiovascular pandemic is the consumption of damaged vegetable oils. Perhaps, no other food has as much an overall health damaging effect to a population of people as do modern, “processed for longer shelf life” vegetable oils - because of the damage that processing does to PEOs, and the consequent reduction in cellular oxygen in people. Blessing and Not a Curse! Virtually no other food is as beneficial to one’s health as the undamaged, Parent Essential oils found in raw seeds, nuts, flowers, green leafy vegetables and grasses. Regularly consuming these foods, or the PEOs extracted from them, is a must for all persons desiring to avoid poor health and enjoy, instead, optimum health. The whole “vegetable oil curse or blessing topic” boils down to whether the oils consumed are going to increase or decrease oxygen transfer from the blood into the cells. And, to ensure that the blessing and not the curse are realized, the foods or oils that contain the PEOs must be raw and undamaged. That’s the key! We look forward to a coming day when the knowledge of the value of PEOs will be as common as the knowledge of the value of Vitamin C… when virtually all people on earth will understand that the prime cause of cancer and many chronic diseases is low cell oxygen… and that the most important way to prevent low cell oxygen is to frequently consume the undamaged, delicate, oxygen attracting oils called Alpha Linolenic Acid and Linoleic Acid which are found in raw vegetables, seeds, nuts, flowers, green leafy vegetables and grasses. When we finally reach that day that people generally understand the importance of Parent Essential Oils, suffering from the greater destroyers of life called cancer and cardiovascular disease will belong to the annals of history (just like scurvy). Certainly, the cause of cancer is not mysterious for those who have read either of Brian Peskin's watershed books. The most fundamental issue to human life is the making of energy inside each cell of the body, by converting oxygen and fuel (fat and sugars) into ATP energy. A vital key to this energy releasing process (burning of fuel in the cellular mitochondria) is having an adequate amount of oxygen inside the cell. If there isn’t an adequate amount of oxygen, then energy production is unavoidably restricted (just as any type of fire must have ample oxygen in order to continue to burn). When energy production is inadequate to meet cellular needs, then many cell operations do not proceed normally, allowing disease to occur. The above concept is the scientific logic behind why Brian Peskin says that Cancer, Parkinson’s, Alzheimer’s Cardiovascular Disease and other diseases are either directly caused or greatly accelerated when cellular oxygen levels are less than optimum. beneficial and harmful effect of polyunsaturated oils (IE. vegetable oils) on cellular oxygen levels… and human health! Brian Peskin has laid out the whole matter of how polyunsaturated fatty acids (PUFAs) either destroy or empower your health, in two groundbreaking books, explaining how and why the health results one gets depend entirely on whether those PUFAs contain damaged or undamaged Parent Essential Oils (PEOs). 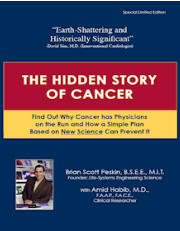 The first book, The Hidden Story of Cancer (went through six printings); it is now out of print and has been replaced by Brian Peskin’s new book, the “PEO Solution”, co-authored with Dr. Robert Rowen. By reading and understanding either of these watershed books, it will become plainly evident to you that cancer, heart disease and many other chronic diseases are the “to-be- expected” result of eating modern “processed for long-shelf life” vegetable oils, partially hydrogenated oils or any adulterated or cooked polyunsaturated oil. A summary of Brian Peskin’s ground breaking research is as follows: 1. Insufficient oxygen within cells is a contributing or prime cause to many modern diseases such as Cancer, Cardiovascular Disease, Parkinson’s, Dementia, etc. 2. Adulterated Parent Omega Oils (polyunsaturated oils) (whether cooked, chemically processed or damaged in any other way) ought not to be consumed. Such damaged oils should be “viewed” as being a long-term destroyer of health because they will incorporate into human cell membranes and reduce the ability of the cells to obtain optimal amounts of oxygen from the blood. The more that one consumes denatured vegetable oils, the more that the oxygen content of the cells of one’s body will be reduced from what it would otherwise have been if those adulterated oils hadn’t been consumed. When denatured oils are consumed and incorporate into cell membranes, it is somewhat like one had coated his/her cells with a plastic coating — making it difficult for oxygen to go from the blood through the membrane into the cell. This hindrance or resistance to oxygen transfer will continue for the entire cell life (3 - 5 months) cycle until a new cell is created and the cell membrane is constructed from undamaged Parent Essential Oils. Such replacement of bad oils with good oils in the cell membrane is like removing that plastic coating from around the cells so that oxygen can now get in. 3. Long chain, Omega derivative oils, such as Fish or Krill oil or Omega DHA and EPA supplements, are radicalized in the human body, thus becoming oxidizing or damaging to the body, making tissues age faster. Therefore, except for very short durations (in most cases, 10 days or less), Omega derivatives should not be consumed. 4. Undenatured Parent Omega Oils (meaning raw, uncooked, not chemically processed Linoleic and Alpha-Linolenic Fatty Acids, found in many seeds, nuts, grasses and plants) will incorporate into cell membranes and upon doing so they will increase the cells ability to obtain oxygen from the blood… leading to less likelihood of the above mentioned diseases and increased likelihood of health and energy. Therefore, they should be consumed regularly. Consider that although high blood oxygen saturation is important, and will result from breathing more oxygen (like the two persons above are doing), if this was sufficient to ensure ample cellular oxygenation, then athletes or persons who regularly exercised, should never get cancer because their cellular levels of oxygen would always be optimally high. Right? Wrong, athletes and people who breathe supplemental oxygen do get cancer! In today’s, processed and fast food world it is common for people to have plenty of oxygen being carried around in their blood stream and yet have insufficient oxygen inside many of their individual cells because THE CELL MEMBRANES (that surround and enclose those cells) have become resistant over time to the diffusion of oxygen across that membrane into the cell interior... because consumer grade vegetable oils have been consumed over a long period of time and have incorporated into some, many or even most of their cell membranes. That’s bad because oxygen deficiency inside the cell is a prime cause of cancer and other modern health challenges. The vegetable oil dilemma that virtually no one talks about, namely — the consuming of typical grocery, vegetable oils undermines and destroys human health (over time). The “unapparent” reason for this is that modern manufacturing methods purposefully alter vegetable oils so that they do not attract, hold and transfer oxygen as well as they would otherwise do. Once they incorporate into cell membranes (oils make up a large part of cell membranes), they resist oxygen transfer from the blood into the cell, adversely affecting cell oxygen content and health. The goal of manufacturers of vegetable oils is to enable their oils to stay “fresh” longer — to be able to sit on store and kitchen shelves longer before smelling rancid. Undoubtedly, they never intended to create a health problem. But, that is what happened. Fifty percent of the bi-lipid membrane of human cells is made from polyunsaturated oil (the type of oil in vegetables). So, when a person eats adulterated vegetable oils those oils will incorporate into a person’s cell membranes and lower the transfer rate of oxygen going from the blood through cell membranes and into cells… and eventually poor health, especially cancer, is the unintended result. Solutions: Don’t eat vegetable oils and especially don’t eat cooked vegetable oils (which further adulterates the oils). Do eat unadulterated vegetable oils, termed Parent Essential Oils (PEOs) because they do the exact opposite — they raise cellular oxygen levels. Please view the short lecture segment below to begin learning why modern vegetable oils are a major cause of the soaring rates of cancer, heart disease, diabetes and so many other modern health challenges. 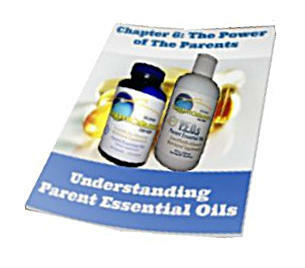 Then, learn why Parent Essential Oils represent a health understanding breakthrough — a true health solution! • Cooking vegetable oils damages the Omega oils that are in them (turning them into oxygen resisting oils, instead of oxygen attracting oils). • Likewise, modern manufacturing processes that seek to create long- shelf-life edible oil products adulterate the vegetable oils making them harmful to health over time. Finally, light photons damage oils when they are stored in transparent bottles. All these practices change PEOs into adulterated, non-functional EFAs that no longer allow optimal transfer of oxygen into cells. • All other EFAs, meaning, excluding ALA and LA, are correctly termed EFA “derivatives.” This includes the most common derivatives such as AA, DHA, EPA, etc., the latter two being the oils in cold-water fish. • What is not understood by most people nor most physicians is that EFA derivatives are made in the body, from the viable parent EFAs, on an “as needed” basis in extremely limited quantities. Consumption of derivatives from food is therefore not necessary, and so consuming fish oil which consists of DHA and EPA in supra-pharmacological OVERDOSES, overdoses the person, potentially causing damage instead of health. The reason that people think they need these fish oil and Omega derivatives (EPA and DHA) is because certain tissues in the body contain substantial amounts of them (primarily the brain). People don’t understand that if they consume enough of the viable Parent oils (LA and ALA) to support their conversion to the derivative oils, they don’t need to directly eat the derivatives. In fact, huge populations never eat fish, but do not have deficiencies of derivative oils. (Learn more about this in frequently asked questions.) Peskin Protocol PEOs, sold at this website, are a patented plant-based proprietary formulation that are be obtained from precise mixtures of organic sunflower, safflower, pumpkin, and evening primrose seed oils and coconut oil, processed very carefully and sealed in soft gel capsules with nitrogen gas to ensure freshness. Please Keep in Mind Always Ample cellular oxygen is a KEY for avoiding many of life’s greatest and most devastating health challenges. Many (probably most) people do not understand that the way to keep cellular oxygen high is to daily consume Parent Omega Oils and to avoid adulterated oils. Because they don’t know this, millions of people have suffered and are currently suffering, needlessly, the consequences of inadequate cellular oxygen. • Adulterated Vegetable Oils are among the most insidious and most health damaging foods (when eaten for a long time) that a person can eat. So avoid foods that contain cooked or processed vegetable oils. • Fish/Krill/DHA-EPA Omega Oil supplements do not provide the oxygen enhancing benefits of Parent Essential Oils and, at the same time, they increase free radical damage in one’s cells, aging one’s tissues more rapidly than would otherwise occur. Ergo… no benefit… only harm. PEOs are the right way to go! • Unadulterated Linoleic and Alpha Linoleic Oils From Vegetable Oils are among the most health promoting and beneficial foods (over the long haul) that a person can eat. So, eat them… Our PEOs supplement is a fantastic way to do that. Polyunsaturated oil understanding is imperative for one to consciously choose health. In order for you to obtain a more thorough understanding of the full import of Brian Peskin’s research into the efficacy and value of Parent Essential Oils in regard to human health, please: • Watch one or more of the amazing Brian Peskin videos • Read the scientific proofs of the correctness of Brian Peskin’s PEO recommendations (American Heart Association 2008). 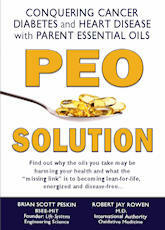 • Order and read Brian’s latest book, PEO Solution. The five most important takeaways of this website, which information is from the research and discoveries of Otto Warburg and Brian Peskin, are as follows: 1. 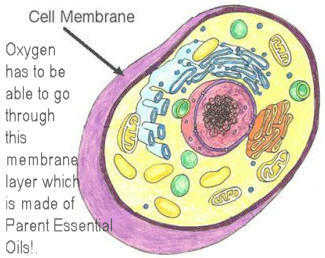 Low Cell Oxygen is a significant cause of loss of cellular health, and consequently overall health. In other words, a state of low cell oxygen is to be avoided. 2. Eating Adulterated Vegetable Oils results (over time) in lowered cellular oxygen levels as those adulterated vegetable oils incorporate into cell membranes and thereafter resist the transfer of oxygen into the cells. In other words, these oils need to be avoided. 3. Eating Unadulterated Vegetable Oils eventually results in increased cellular oxygen levels as those unadulterated vegetable oils incorporate into cell membranes and thereafter increase the transfer of oxygen into cells. In other words, these oils need to be consumed regularly. 4. Supplementing with fish oil results in increased free radical damage (more rapid aging of cells in the body) and, also, interferes with immune function, similar to steroids. In other words, fish oil is mildly toxic to the body and should be avoided. 5. Mono-unsaturated oils and saturated oils have no impact on cellular oxygen levels. In other words, they’re excellent food, and can either be eaten or left alone, according to preference. The understandings, 2 - 5 above, from Brian Peskin, actually, show us how to apply the original discovery of Dr. Otto Warburg regarding the undesirable state of having too little cellular oxygen: • Dr. Warburg learned (more than a century ago) that if oxygen content in a cell is reduced by 35% of its metabolic oxygen requirement, such a cell will stop trying to use oxygen to meet its energy needs and will start to rely, instead, on glycolysis (fermenting sugar anaerobically, a primitive survival mechanism) to gain energy. • Dr. Warburg observed that for a cell to meet its energy needs through glycolysis of sugar is, ultimately, so disruptive to cellular health that a cell cannot stay long in this glycolysis metabolic state before it becomes a cancerous cell and soon becomes unable to return to normal oxygen metabolism. This low oxygen state is what Dr. Otto Warburg calls the prime cause of cancer. • Brian Peskin’s first great contribution, that consuming adulterated PEOs lowers cellular oxygen levels, as adulterated PEOs incorporate into cell membranes and resist oxygen transfer through cell membranes. This means that a most important step for avoiding cancer is to avoid eating adulterated vegetable oils so that cell oxygen levels don’t go low. • Brian Peskin’s second great contribution is that eating unadulterated PEOs increases cell oxygen transfer into cells and increases the odds of avoiding, not only cancer, but many other modern diseases that have low oxygen as a contributing cause such as Cardiovascular Disease, Alzheimer ’s, etc. The discovery of these two principles regarding PEOs is a discovery of a magnitude worthy of a Nobel Prize. • In hindsight, Dr. Otto Warburg could not have imagined that modern food preparation processes would damage delicate polyunsaturated oils and turn them into oxygen-resisting oils, which after replacing oxygen-attracting polyunsaturated oils in cell membranes, lowers cell oxygen and has launched a modern epidemic of cancer, cardiovascular disease, Alzheimer’s, etc. Thanks to Brian Peskin, we understand that the only thing that works long term for having optimum cellular oxygen levels — is to ensure that oxygen in the bloodstream is able to penetrate the cell membrane and go from the bloodstream THROUGH the cellular membrane into the cellular cytoplasm. This lipid membrane is key to health… and needs to get the attention it deserves by eating the things that make up a healthy membrane. Having high oxygen saturation of blood is all most doctors are trained to think about in terms of the body’s oxygen needs and yet oxygen saturation levels don’t mean that much if the oxygen doesn’t transfer into cells. People who want to be healthy throughout their lives need to make sure that the bi-lipid layer constructs of their cells do not resist oxygen transfer, and better yet, increase attract and oxygen transfer, which is what PEOs do. That is the quintessential fact that Brian Peskin discovered, namely, that the oils a person eats have a large effect upon cellular oxygen levels. Brian Peskin identified two most important oils, Linoleic & Alpha Linolenic, which he terms Parent Essential Oils, which, when incorporated into cell membranes produce higher rates of oxygen diffusion through the cell membranes than when cell membranes are constructed of other oils. In fact, cell membranes made from unadulterated Parent Essential Oils can transfer up to twice as much oxygen from blood to cellular fluids as can consumer-grade, (processed for long shelf-life) vegetable oils. With unadulterated Parent Essential Oils in our cell membranes, one’s cellular oxygen levels will be much higher… and as a result one’s propensity to oxygen-deficit diseases will be MUCH LOWER. Brian Peskin, along with many other health researchers believes that many chronic diseases, including Cardiovascular Disease, Cancer, and many more can partially, or substantially, be attributed to the long-term consumption of damaged Parent Essential Oils, and/or the lack of consumption of the undamaged Parent Essential Oils. So, it is very important to understand that having high levels of cellular oxygen is not a matter of breathing deeply as much as it is of ensuring that one’s cells are built from PEOs. PEOs are the two particular polyunsaturated (Omega) vegetable oils, known scientifically as 1. Linoleic Acid (LA) (Parent Omega 6) and 2. Alpha Linolenic Acid (ALA) (Parent Omega 3) They are are short-chain, “oxygen-attracting” oils. They are found in seeds and plants. They are important for a couple of reasons, but the one we are focusing on is that they readily intake, hold and release oxygen. It is important to understand that oils make up 50% of the bi- lipid membrane that surrounds each cell in the body. Ideally, up to a third of these oils will be PEOs, which help oxygen readily move from the bloodstream into the cell. These two oils cannot be made by the body and so must come from the diet, which is why Brian Peskin has coined the phrase, Parent Essential Oils (PEOs), for referring to them. Oxygen Inside the Cells is Paramount to Health Having optimum amounts of oxygen within human cells enables the creation of optimum amounts of energy in cellular mitochondria. Ample oxygen is essential to both cellular fires and campfires. Just as a campfire doesn’t burn well without oxygen, so, too, without enough oxygen, cellular mitochondria have a difficult time burning fuel (carbohydrates or fats) to make energy for the cell to be healthy. And, total health is the result of the cumulative health of one’s cells. Therefore, ensuring the adequacy of cellular oxygen is near the absolute top of any list of health priorities that one should have. However, deep breathing and oxygen supplements are not the way to do that. The way to do that is to ensure that one’s cell membranes are constructed from the two, thin, “oxygen-attracting” oils that we call Parent Essential Oils. likely result of ample levels of cellular oxygen. Can Be Quite A Challenge! Oils) Are A Blessing and Not a Curse! and Enjoy Decades More of High Quality of Life! oxygen levels… and human health! Brian Peskin has laid out the whole matter of how polyunsaturated fatty acids (PUFAs) either destroy or empower your health, in two groundbreaking books, explaining how and why health results depend entirely on whether those PUFAs contain damaged or undamaged Parent Essential Oils (PEOs). The first book, The Hidden Story of Cancer (went through six printings); it is now out of print and has been replaced by Brian Peskin’s new book, the “PEO Solution”, co- authored with Dr. Robert Rowen. By reading and understanding either of these watershed books, it will become plainly evident to you that cancer, heart disease and many other chronic diseases are the “to-be-expected” result of eating modern “processed for long-shelf life” vegetable oils, partially hydrogenated oils or any adulterated or cooked polyunsaturated oil. The understandings, 2 - 5 above, from Brian Peskin, actually, show us how to apply the original discovery of Dr. Otto Warburg regarding the undesirable state of having too little cellular oxygen: • Dr. Warburg learned (more than a century ago) that if oxygen content in a cell is reduced by 35% of its metabolic oxygen requirement, such a cell will stop trying to use oxygen to meet its energy needs and will start to rely, instead, on glycolysis (fermenting sugar anaerobically, a primitive survival mechanism) to gain energy. • Dr. Warburg observed that for a cell to meet its energy needs through glycolysis of sugar is, ultimately, so disruptive to cellular health that a cell cannot stay long in this glycolysis metabolic state before it becomes a cancerous cell and soon becomes unable to return to normal oxygen metabolism. This low oxygen state is what Dr. Otto Warburg calls the prime cause of cancer. • Brian Peskin’s first great contribution, that consuming adulterated PEOs lowers cellular oxygen levels, as adulterated PEOs incorporate into cell membranes and resist oxygen transfer through cell membranes. This means that a most important step for avoiding cancer is to avoid eating adulterated vegetable oils so that cell oxygen levels don’t go low. • Brian Peskin’s second great contribution is that eating unadulterated PEOs increases cell oxygen transfer into cells and increases the odds of avoiding, not only cancer, but many other modern diseases that have low oxygen as a contributing cause such as Cardiovascular Disease, Alzheimer ’s, etc. The discovery of these two principles regarding PEOs is a discovery of a magnitude worthy of a Nobel Prize. • In hindsight, Dr. Otto Warburg could not have imagined that modern food preparation processes would damage delicate polyunsaturated oils and turn them into oxygen- resisting oils, which after replacing oxygen-attracting polyunsaturated oils in cell membranes, lowers cell oxygen and has launched a modern epidemic of cancer, cardiovascular disease, Alzheimer’s, etc. The shortest way to summarize our message is: cooked or processed vegetable oils damage health, by reducing cellular oxygenation, while raw, unprocessed vegetable oils, termed Parent Essential Oils (PEOs), do the exact opposite — and are an immense support to optimal health. Please view the short lecture segment below to begin learning why modern vegetable oils are a major cause of the soaring rates of cancer, heart disease, diabetes and so many other modern health challenges. Then, learn why Parent Essential Oils represent a health understanding breakthrough — a true Fountain of Youth!